Cyndi put the finishing touches on her beaded postcards! I stood in the kitchen, looking out the back window. I couldn't watch the cab pull away... not completely. My eyes were hot and tears stung. I promised Meryl I wouldn't cry. I broke my promise Meryl. Session 1 of our workshop is over. Most of the students have already left or will be leaving within the next few days. I wasn't warned that I would be absolutely crushed when everyone left. Is that weird? I only knew them for four days, but what amazing four days those were! For four days I tried to make their hopes and dreams my own. For four days, we tried to make Tucson a magical and wonderful experience that they can carry with them for the rest of their lives. I tried my best to do everything in my power to make this a wonderful experience. I feel really honored to have been allowed this opportunity to facilitate this workshop, sharing some of our favorite things and capturing the moment. 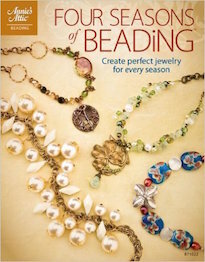 We did a lot this session, finding treasures and experiences like glittering jewels strung across a dusty parking lot. They were there – you just had to look for them. 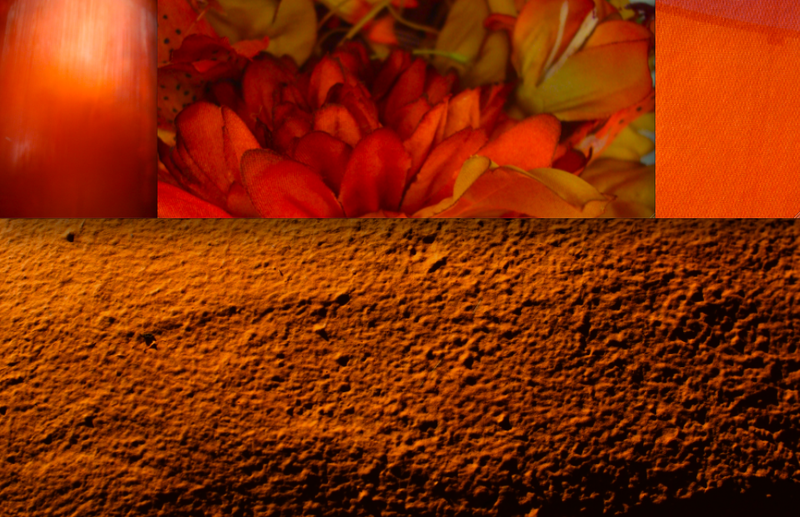 I encourage you to visit the blogs of everyone involved to delve into the experiences. 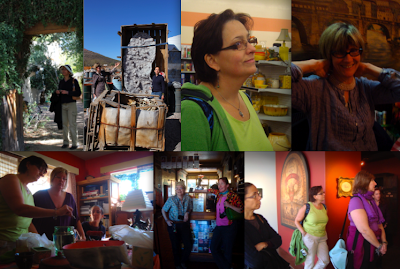 If you haven't seen the blogs of Kathi, Ellen, Beth, Laurie-Anne, Charlene, Doriot and Meryl! Everyone saw the trip so differently! I would write more. I would write about our adventures today and the things we did, but it's making me tear up again when I think about all the moments of wonder we shared. 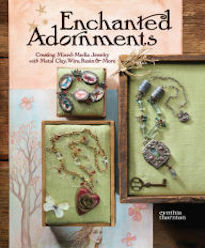 I just got a look at the new products from my family at Green Girl Studios! There is a great variety of different pieces, from flying skulls based on New England headstones, to peacocks and baby wind-up robots and panda bears. Lots of new goodies! The Elephant charm, which belongs to the Little Blessings Series says, "Happy Memories". I think though I am in love with the tiny rabbit. It's miniscule and so detailed. It would definitely work in a pair of earrings or on a nice charm bracelet or on a dainty necklace. That's not all though! They've been busy! They made a lot of Mechanical owls and octopi with stone eyes, and did a variety of beads that used to be in gold-plate and started casting them in bronze and shibuichi. Isn't everything wonderful? Lots of new debuts for Tucson! 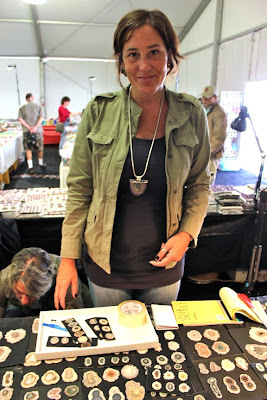 Most of today was devoted to Gem Shows. 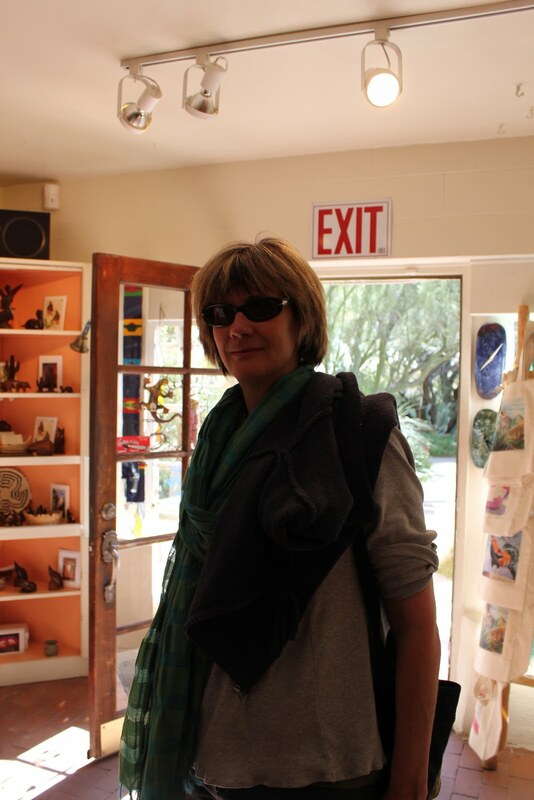 We made a foray to the Tucson Museum of Art and Old Town Artisans, but half the group made a beeline back to the African Village to shop more in the afternoon. 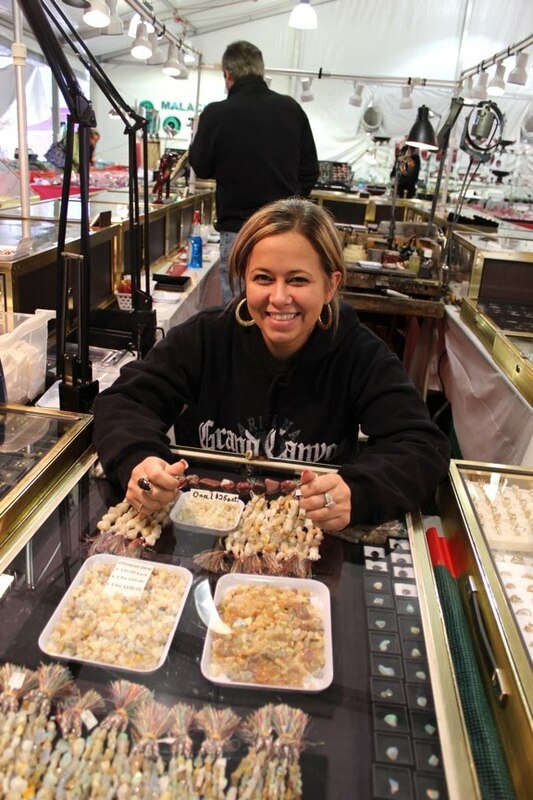 If you've never experienced the Gem Shows in Tucson, it's really unique. There are dozens of shows, all with different things. Some of the pieces of crystal are easily a story tall. 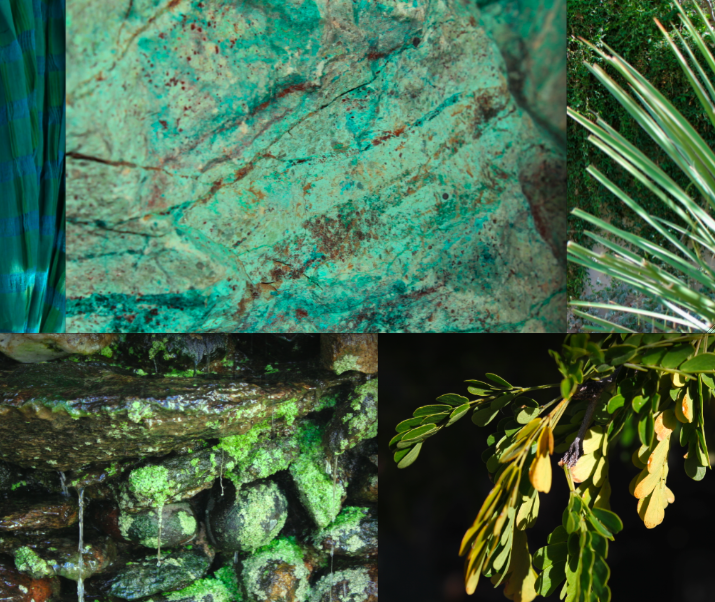 There are crates of stones filled with water and some with oil, bringing out the true colors and patterns of some of the more porous and unpolished stones. Anything can be found here. From ancient dinosaur bones, to bathroom sinks made from carved fossils. To the right and above are Meryl and Doriot looking at trilobites and ammonites frozen in time and stone. I was worried that we wouldn't be able to make it back to the African village, but we were lucky enough to be able to go. It's a dry and dusty parking lot, that is covered with tents filled with beads and artifacts from Africa. I love all the statuary and the interesting carvings with nails and found objects. What a great beginning to the Gem Shows! I think one of my favorite parts of the attending the Gem Show is meeting all the vendors. They come from all over the world, bringing their wares and sharing their stories. The folks from El-Mar Enterprises actually come from Plant City, Florida. When I was a boy, we would go to Plant City to pick strawberries. They have a beautiful selection of jewels. All the way from Lithuania, Daiva was showing her amber. She had quite the selection! Selena was showcasing some of her cross-sections of stalactites. They looked like sugar-coated discs, capturing the creation of the universe or the division of cells or the bones of a saint. Only about half of the vendors who I talked with in the African Village agreed to have their picture taken. I'm really glad that my new friend, pictured above, was willing. I think it's a great portrait of him. We ran into my friend, Lillian Cartwright. 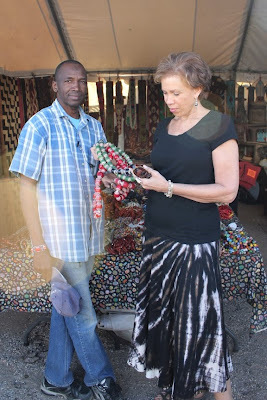 She was visiting with one of her favorite vendors, who she said knows all about the beads and has been teaching her over the years about different African beads. The days here in Tucson with the group have been full. I really don't know any other why to describe it... maybe spelnded? Maybe rich? Maybe luxuriously brimming? In any event, we've been exploring Tucson, finding treasures, eating fabulous lunches, and taking LOTS of pictures. 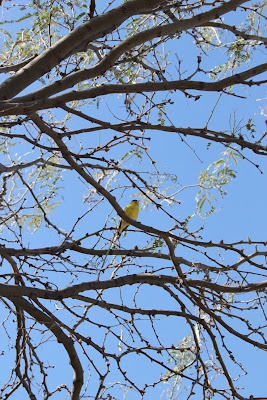 Yesterday we went to Tohono Chul Park in Northwestern Tucson. 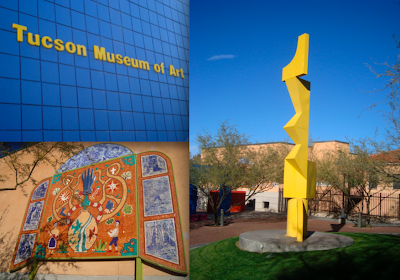 It's part art museum, desert garden, and al around beautiful place. It's a surprising little gem! 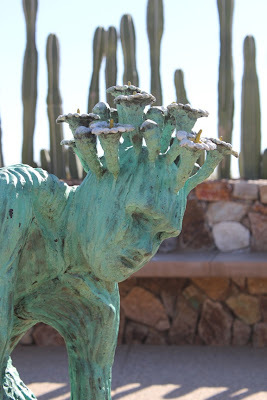 One of my favorites, and probably one of the most photographed objects in the "Cactus Man" statue. It's surrounded by a two partial semi-circular stone benches topped by organ cacti, reading straight to the sky. I always worry about going to any botanical place in winter. Even if winter consists of 70 degree weather. You never know what will be alive and what will be dead. Luckily there was a lot in bloom and the lushness of the shade gardens was rich and full, much like our days. One of the things that I love about this place is that it sit at the foothills of the Catalina mountain range, which border Tucson to the North. Wandering along the trails, a pocket of land in the city, it was easy to forget yourself... to feel out in the wild of the desert, standing at the base of the mountains. The number of various birds, swinging and swooping was really impressive. I love the little gold finches. 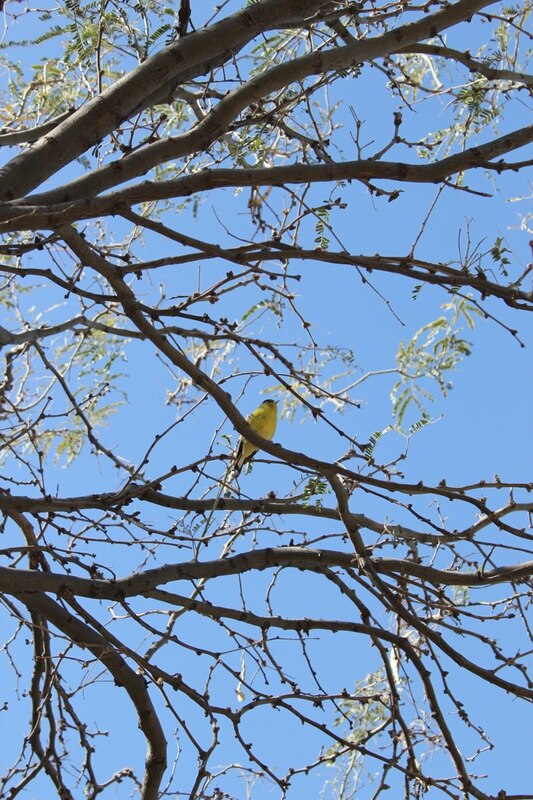 I sat in the courtyard for away, listening to their song and watching as darting bodies of bright yellow flicked around the sky. Above is a great shot of Charlene. Later in the day Charlene made me laugh so hard, I thought I'd choke on my lunch. I really love the group we have assembled. I really couldn't ask for more. Another of the fabulous participants is Meryl. She's staying here at the house and we've been talking into the wee hours of the morning. She's such a sweet, grounded force. I love that she's a librarian and is using this experience to help build a blog for the library that she works at. People are coming for all different reasons. Another great gal in the group is Kathi! She was our last sign up for the first session of the workshop and I'm glad she decided to come. She was adamant that she had no interest in blogging, but I'm glad that she decided to push herself and step out of her comfort zone. I know that talking with her and looking at her images has been extremely exciting and enriching for everyone else involved. At the end of the day, we all met back at the Atomic Ranch to go over our days with a glass of wine and some good company. We worked on our assignments and I think it was a great environment. I could hear the mental wheels turning. And of course... the food shot. 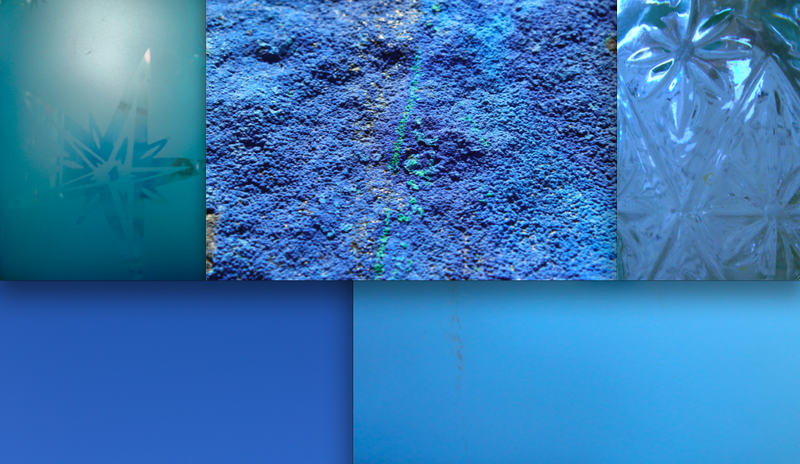 When I begin making work, I like to create a new color wheel for myself. Light is the foundation of vision and is created by a spectrum of rainbows. 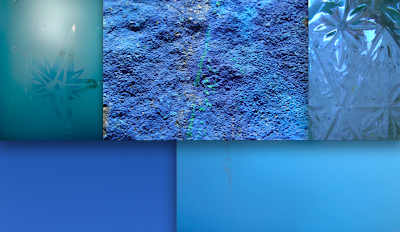 Color is everywhere, even in the purest, whitest light. So today, I asked the group to be mindful of color and to create their own personal color charts, unique to their own experiences and adventures. I think it's a great exercise to train the eye and give focus to our capturing of the moment. Below are my examples. All the the images of color were taken either at the Tohono Chul Park or on one of our shopping adventures today. What an amazingly full day, brimming with treasure-hunting and exploration! I feel really lucky that the group is filled with some really delightful people from all over with different backgrounds. Being with them is a real pleasure and I have so totally enjoyed getting to know them all better! I laughed out loud when I saw the title of this book laying on one of the shelves. I don't know what it's about, but days like today make it certainly seem true and make me eternally grateful! Above are some shots I took throughout the antique mall. One booth had an amazing collection of vintage telephones. Above and to the right are Beth, Doriot, and Laurie-Anne talking about cameras. To the bottom are some great pieces I saw around the store. After we extracted ourselves from the antique shop, we headed over to the Lost Barrio to introduce the area and visit the Eclectic Flea. What a fantastic shop! I love the diverse selection of folk art, books, reliquaries, and vintage furniture. We met up at the Atomic Ranch for lunch by the pool in the sun and a quick round of show and tell! The above picture and to the left is of the Canadians soaking up a little bit of sun. To the right are Ellen, Laurie-Anne, and Charlene. It was interesting to see what everyone found! After meeting up at the home base for some refueling, some sun, and some sharing... we headed downtown to check out Sacred Machine. I've written about Sacred Machine HERE and thought that the folks in the workshop would really enjoy themselves looking at the art and learn a lot. Daniel was there, which was a special treat. Both he and Paula were so generous to talk to us and share a little bit about their processes, their everyday life and their thoughts on community. They really awesome! Tucson really is fortunate to have them! Daniel, co-owner and resident artist from Sacred Machine, also designed the stage at the Club Congress in the historic Hotel Congress. What beautiful work! I love all the cut metal and tracery of patterns! It's a fabulous venue. As the day started to wind down, we headed down to 4th Avenue! I really like 4th Avenue! It's filled with lots of cute shops, cafes, bars, and restaurants. The above picture was taken at a cute little vintage shop called Preen. They had so many beautiful vintage clothes there. Sometimes I wish that boy clothes were half as interesting as girl clothes. To end a very full day, we dined at Caruso's Italian restaurant. I had the cheese ravioli with a garlic mushroom sauce. It was absolutely divine! I felt like each ravioli was a pillow of fluffy cheese, perfect for soaking up the beautiful sauce. The first of the attendees of the workshop arrived today. Meryl came in during the early afternoon and enjoyed lunch with us. Later, it was time to retrieve Doriot from the airport. I made roasted pork loins with a spicy, cinnamon rub and mashed sweet potatoes for dinner. Doriot and Meryl created a beautiful salad. We raised our glasses high and toasted. At the end of the meal, Doriot and Meryl brought out some treasures that they wanted to share. Doriot had some fabulous (smuggled) French coconut cookies filled with cream. The taste of the toasted coconut in the wafer-thin cookies was supreme! Meryl retrieved a lock and key from France, some preserves for Doriot, and a blue abalone shell she had collected at Laguna Beach when she was 13 years old. I thought that she was just showing this childhood treasure to me. But in fact, it was a gift! I feel honored to be the recipient of such a thoughtful and powerful present. 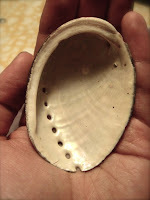 Shells often times represent artist ability, creative endeavors, luck with new relationships, and a change of consciousness. How fitting for our workshop! 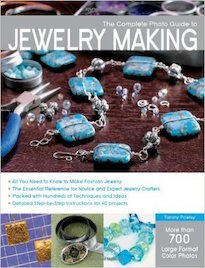 Last night, I stayed up late finishing my portion of the handout for our workshop. It was edited and re-edited and edited again. 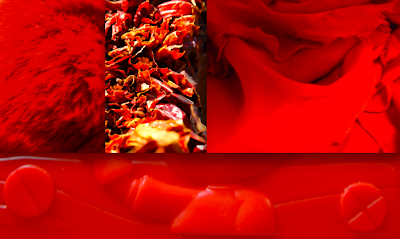 I peeled back the layers of my heart, examining why I do the things I do and how I do them. I so badly want those who attend the workshop to understand the core of my motivations and operations. In the handout, I talk about art and philosophy. I talk about essential truths and the resonance of being genuine. I talk about creativity and my path as a storyteller. I feel as though much was revealed in the quiet hours of the night. It's my hope that my words will hold meaning and help inspire others to dig deep as well. 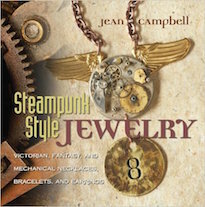 The winner for this past week's Thursday Giveaway featuring a Steampunk-inspired beaded brooch by Cenya of the Emerald Window AND a bonus prize of a set of Extreme Trios of Soft Flex flexible beading wire is Krista of French Elegant Jewelry. Congratulations! Email me your contact information and I'll drop your prize in the post! Be on the look on Thursday for another chance to win! I've just added more goodies to the shop! I've done a much needed update to The Skull Shop and have included some really amazing beads. Some of my favorites are the ones carved from porous lava rock or the really amazing turquoise pieces. I also really love the hand-carved bone beads. I've grouped them in lots to make them more affordable; I think they look killer in a bracelet like in the one I made HERE. CLICK HERE to check out the recent additions to the Skull Shop. One of the things that I hope people take away from this experience is a sense of community. I can't think of anyone I know who is happily successful who exists in a void. I firmly believe that the rising tide raises all boats. When you help and support those in your community, the favor will be returned in some form or fashion down the road. When I was in school and took various residency programs, the people that I met are some of the most valuable resources I walked away with. Some of them have become lifelong friends and important business contacts. 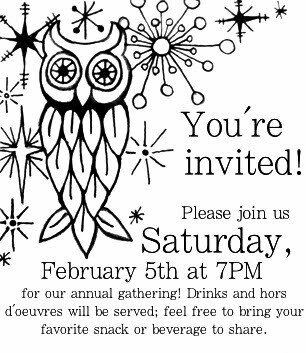 So, I hope that everyone who comes will take in account what a stellar group of people are assembling. I've been holding on to these antique Buddhist Reliquary pendants from Thailand for awhile. To be honest, I didn't want to part with them. I love the little cases, holding within them touchstones to spirituality, calmness, and serenity. But do I really need twenty of them laying around? Possibly... but more practically I'm going to send them out into the world to make others happy and keep the wheel of creativity turning. CLICK HERE to see the selection of NEW Thai Buddhist Reliquary Pendants! If you're coming to Tucson, be sure to mark your calendars (or add a memo on your smart phones)! 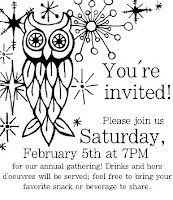 We're having our annual party on Saturday, February 5th! Party starts at 7PM. Should be a most excellent time. 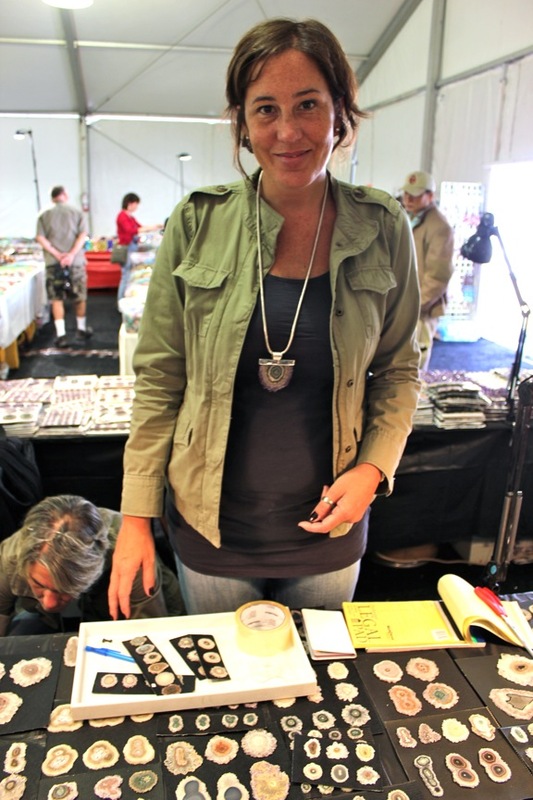 The Atomic Ranch is conveniently located a few blocks away from the To Bead True Blue Show. Email me for the address. I've added a couple of Lisa Peters Art ceramic skull beads. I've been holding on to these for awhile. I thought about keeping them for myself. 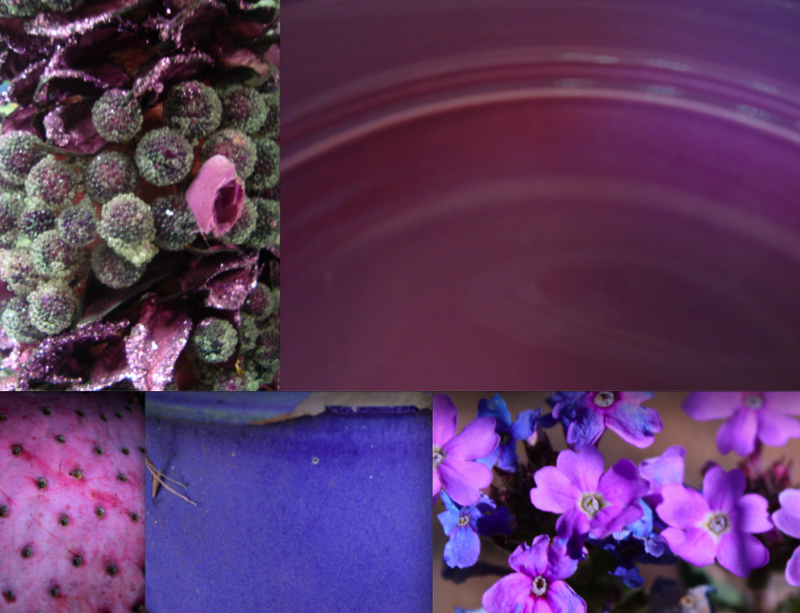 CLICK HERE to see the collection of Lisa's work in my shop. I'll be adding more to the shop fairly soon, but don't delay as many of these are limited edition or one of a kind items! Beaded objects don't always have to be wearable. How about some beaded postcards? I don't know if all of you out in the blogosphere can feel it, but I feel as though I'm swelling with inspiration and creativity. My mind and spirit are expanding to seemingly limitless potential! The moment is pregnant with possibility. Every day that I am here, my ideas are ripening, forming a promising future full of fruitful harvests! How very wonderful! Within the next few days, I'll be beefing up the shop with updates to help fund these projects. I've got some really exciting treasures to share, including some that I've sat on for the past eight months. I like the idea that the things I love and the things I've made will help rusher in the next chapter of my creative story. I like the idea that this story is made possible by the support of those who care about me and where I am going. I feel as though everyone who makes purchases in the shop is an investor in my future. What a beautiful thought! Above: The moon and a constellation of electric lights taken on a midnight walk. The past few days have been pretty mellow. Soon things will get a lot more hectic, so I took the opportunity to do some reading and catch up on some work. I did a couple of errands, but kept things low-key. I went for long, leisurely strolls, and did a lot of writing. The desert muses have been kind to me. The past few days, while extremely full and highly rewarding, were also a little isolating. Aloneness is liberating for me, but it is a bitter pill. 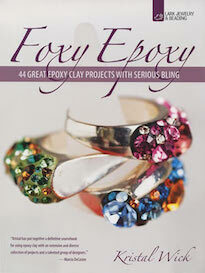 I am really looking forward to the workshops! What wonderful points of light ahead on the horizon! Only a few more days until people start arriving. I am so excited to meet everyone and to get to know them better. What wonderful adventures! And the best thing is that nothing is fixed in stone. The workshop will evolve according to the students. We have a rough framework, but a lot of room to work and play within it. So many wonderful opportunities have presented themselves and it'll be up to them if they want to take a day trip to an artist town or dance with tribal warriors or hike into the hills. I am told that one of our students can't make it. What a shame! I was so looking forward to meeting her, but this opens the seat up. If you've been debating whether or not to come, you should definitely seize the opportunity as it will be wholly unique. CLICK HERE for more information and to sign up. But don't delay... time is running out! I love a good road trip! Don't you? 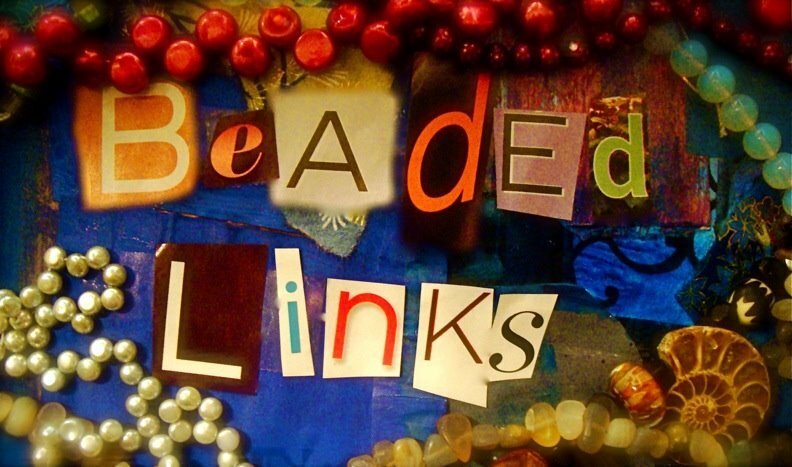 Follow my friends, Joan and Lana of Off Center Productions, on the Beads of Clay blog as they make their way from the Pacific Northwest to the desert in a series called, "Tucson or Bust: Notes from the Road". 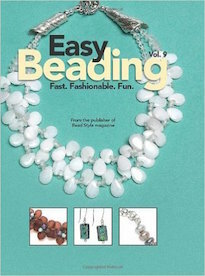 They'll be documenting their journey in their RV as they make their way to the Best Bead Show. CLICK HERE to join them on the road. 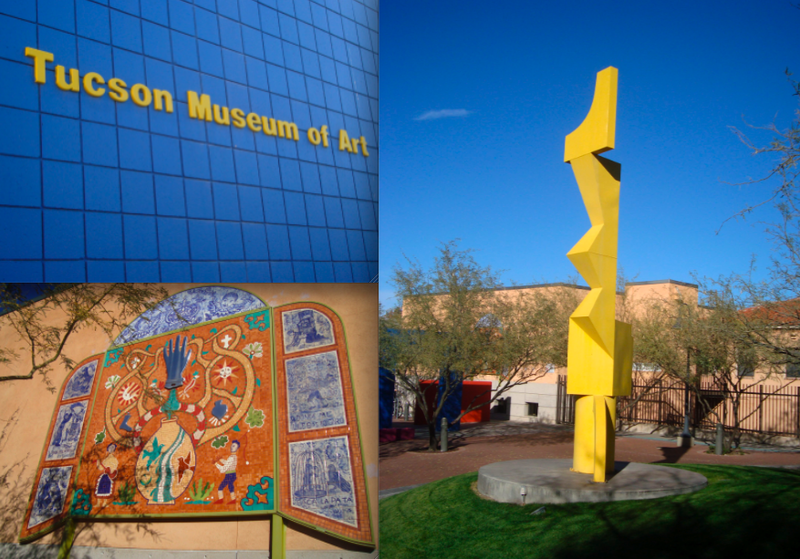 Yesterday I finally made it back to the Tucson Museum of Art. I went for a talk called, "Niki de Saint Phalle: High Priestess of the Tarot Garden". Apparently they have a new talk every Wednesday. I was only roughly familiar with Niki de Saint Phalle's work (mostly the "Nanas", but had a great time hearing more about it and learning about the artist. What a fascinating, productive and multi-talented artist! After the talk, I had the opportunity to finally check out the rest of the collection. Unfortunately, they don't allow photography indoors. Otherwise I would share some of the highlights. I particularly enjoyed the galleries in the Historic Buildings. The Pre-Columbian collection is really amazing. I spent about an hour sketching in there. In the main galleries, I had a nice time looking at the Chinese art and the more contemporary pieces from the permanent collection. Some of my favorite's from the Chinese exhibit were the ceramic Lokapalas from the Tang Dynasty and the "Veseel with embedded Bronze coins" from the Han Dynasty. Just behind the art museum is Old Town Artisans. 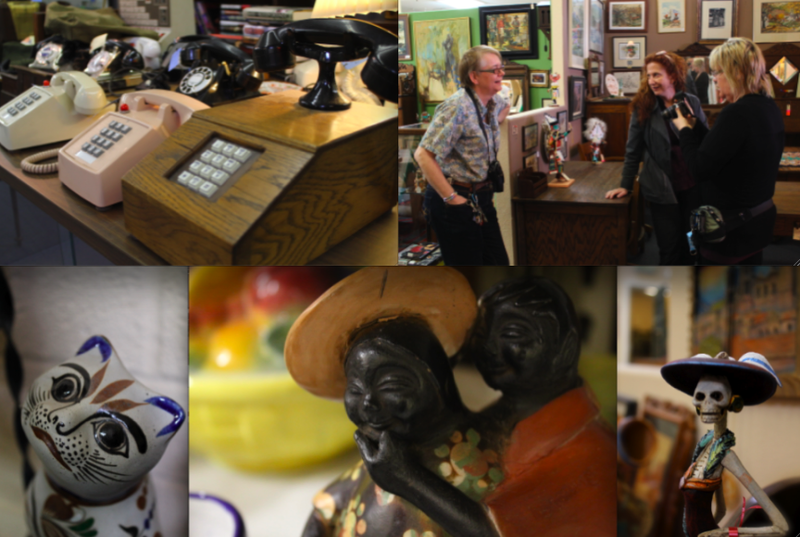 What a fantastic collection of local artistry, imports, and interesting finds! The old building with the meandering shops is truly a gem. I had the chance to talk with one of the shop owners, Eddy. He's one of the six shop owners and has a space full of imported treasures. Hopefully we'll be able to arrange for the students in the first section of the Capturing the Moment workshop to come by for a special event! He's having authentic Amazonian dancers in full, feathered regalia coming in. What a rare treat! It was a nice day spent absorbing work, both ancient and contemporary – learning about new artists, traditions, and ways of making. 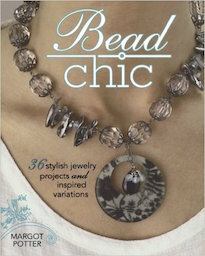 The theme for the Artbeads.com challenge this season is: Winter Enchantment. We were asked to create a piece that embodies what we find beautiful or inspirational about the season. In my my mind, I envisioned something that would be worn by a wintery nymph, frost-encrusted, and glittering with icicle adornments. 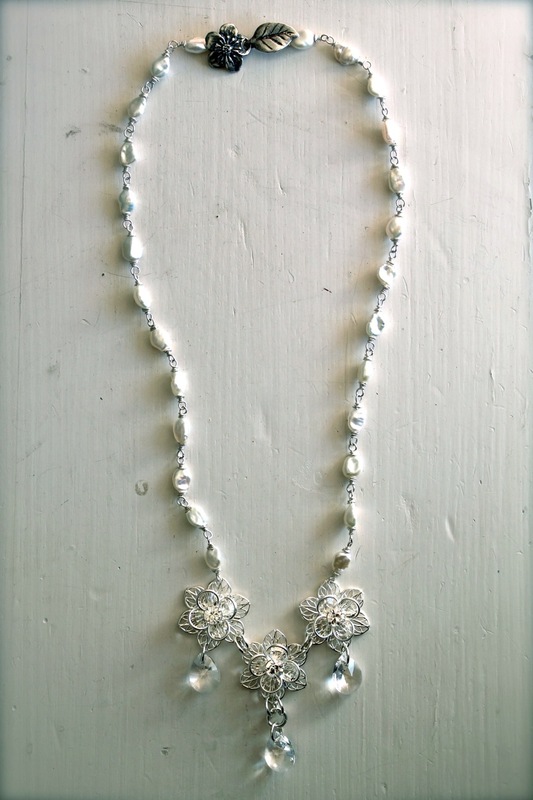 For the project, I chose Swarovski crystals, freshwater pearls, silver jump rings, and used a sterling silver small flower clasp from my family. I call this piece, "Snowflowers". 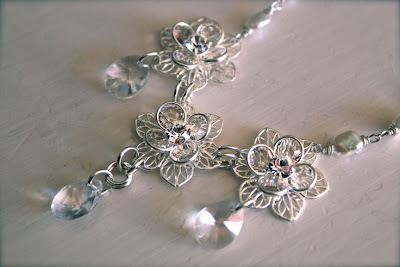 The Swarovski crystal encrusted Silver-plated filigree components were perfect! They were delicate, seemed to bloom with icy coolness and when clustered together, provided a most excellent focal. 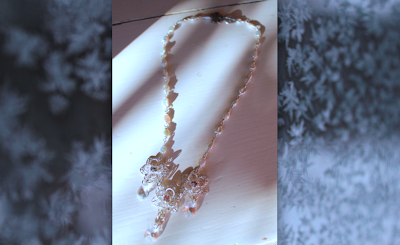 I wanted to keep the necklace as airy and crystalline as possible, but also wanted to capture the feel of snow. Snow is not just "plain white". With the changing of light and the cast of shadows, snow picks up subtle hints of pale pinks, light blues, and misty grays. Pearls, with their layers of nacre, also have this ability to absorb light and shift lustrously. I wire-wrapped the Keshi pearls, creating a chain of irregular points of light. 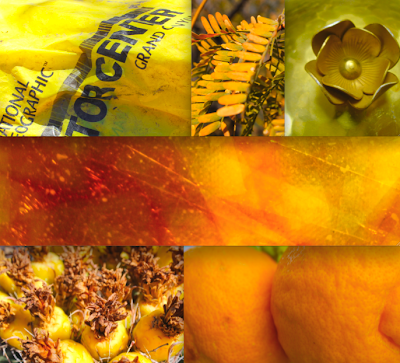 Above is a close-up shot of the focal elements. The new Swarovski crystal Xilion Mini Pear Pendants look like frozen teardrops. 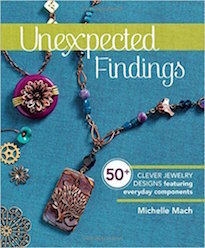 They capture and reflect the light magically and add a touch of whimsy and glittering movement suspended by jump rings.